Visit http://www.sundaywithachanceofmeatballs.com to check out the new look! My family has always placed food at the center of every gathering or event we’ve had so that may explain why I start thinking about what I’m going to have for lunch during breakfast, and what’s for dinner as I’m eating lunch. This blog is dedicated to all of those people who can’t stop thinking about food and don’t wait until Sunday for family dinners! 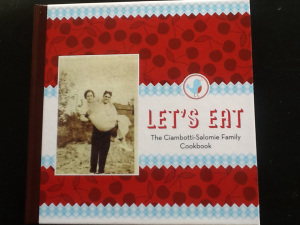 That’s my grandparents on the front cover of my family cookbook! Joe and Teresa Salomie! My grandmother, my Uncle Joe, my Aunt Jean and my mother Gloria have all inspired my love of food, cooking and experimenting! Welcome to my blog, inspired by family, enhanced by friends!